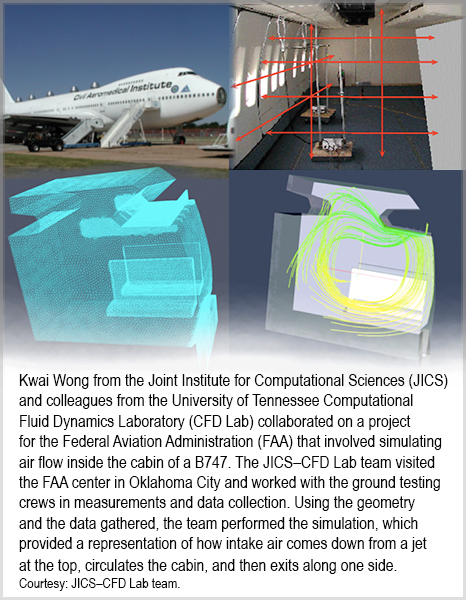 The collaborative ties between the Joint Institute for Computational Sciences (JICS) and the College of Engineering (COE) at the University of Tennessee, Knoxville, recently became stronger, as JICS computational scientist Dr. Kwai Wong received two research leadership appointments in COE's Department of Mechanical, Aerospace, and Biomedical Engineering (MABE). By a departmental vote and approval of UT Provost Susan D. Martin, Wong in December was appointed a research professor in MABE. In addition, he was named director of the UT Computational Fluid Dynamics Laboratory (CFD Lab), a graduate-level research component of the MABE department formerly lead by Dr. A.J. Baker, now professor emeritus. Formed in 1982 by Baker, the UT CFD Lab endeavors to foster collaboration among aerospace technical and academic research colleagues, UT COE graduate students focused on CFD research or applications, and industrial entities. The lab's mission expanded seamlessly with the parallel computing initiative of JICS (founded in 1993) upon the appointment of Wong as research scientist in 1996, Baker said. "During its 30-year existence, the CFD Lab academic/research team has matriculated [accepted] on average one MSc or PhD degree each year," Baker said. "Dr. Wong was a key committee member of the most recent PhD, which was completed and awarded in 2013. The joint academic publication record of CFD Lab team members or graduate students numbers about 300, including five textbooks organizing academic content generated from the CFD research focus, supported in part by approximately $10 billion in contracts from NSF (National Science Foundation), NASA [National Aeronautics and Space Administration], DoD [U.S. Department of Defense], DOE [U.S. Department of Energy], FAA [Federal Aviation Administration], ASHRAE [American Society of Heating and Air Conditioning Engineers], and a range of commercial industry." The natural science of fluid flow, fluid dynamics is ubiquitous in everyday life. It is, for example, integral to the operation of major appliances, inhabited-space air conditioning, aircraft performance, energy performance (wind turbines, for example), the automotive industry, and the human body. "CFD, which must address turbulent flow fields coupled with thermal and mass-transport processes, requires an abundant computing resource to predict these phenomena with fidelity," Baker said. "Obviously, the Jmic research mission." 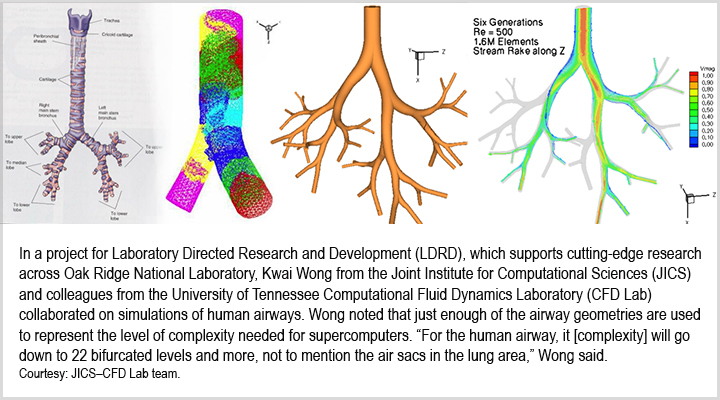 A research focus for Wong is the animate side of CFD, specifically the analysis of the fluid–thermal systems of the human body, ranging from the bronchial-tree system to organs and audio functionality. He and colleagues have devised a number of simulations to probe what happens when aberrations affect the remarkably intricate biological flow system—events such as stenosis [narrowing of blood vessels], stroke, and heart problems. Using an analogy from the everyday world, Wong said CFD might be thought of as "computational football dynamics," because it involves distance, time, and material characteristics (an oblong-shaped object with a pebbled surface). Further, the way the ball is thrown or hit in any sport determines travel evolution—a pitcher's curve ball or a backward-spinning golf shot. The features of everyday fluid dynamics phenomena suggest that for CFD to generate accurate results, research must dedicate precise attention to all aspects of the existing mathematics, physics, and material properties. The combining of fluid-dynamics studies and high-performance computing (HPC) has allowed for the verification of experimental outcomes in the aircraft industry. CFD and JICS have collaborated on projects for the FAA to study air-circulation patterns in 747 jets. In these studies, explicitly nonlinear differential equations that admit chaotic behavior (turbulence) are used to describe CFD performance, Wong said. Wong explained that fluid dynamics studies and HPC are also paired in research directed at a vast array of energy applications. Among the areas of focus are power plants, the combustion process, and the transport process as it pertains to the movement of fluids throughout a power plant. Studies in the energy-application realm also deal with designing cooling systems so they can appropriately handle heat transfer. In addition, the function of power plant and turbine machinery are of interest. With respect to examining the air circulation patterns in buildings, JICS and the CFD Lab are working together on a proposal to ASHRAE that combines wind-tunnel experimentation with numerical modeling and simulation. ASHRAE is a building technology society that seeks "to advance the arts and sciences of heating, ventilating, air conditioning and refrigerating to serve mankind and promote a sustainable world," according to its website. Wong noted, "Computation can be used to verify some of the typical scenarios that ASHRAE is looking for." Commercial industry welcomes assistance in addressing CFD challenges it faces when aiming to improve the effectiveness of existing CFD software traditionally used in the fluid–thermal sciences. With newly developed algorithms and methodologies, "we can open up new capabilities that have been missing," Wong said. "Large-scale computational science capabilities change thinking in the direction of more-substantive theoretical musings." In fact, all areas of engineering are interested in improving the performance of CFD software packages to enable better design, he added. Wong said he is excited that his new roles will improve the proximity and visibility of JICS relative to MABE, CFD Lab, and UT-Knoxville COE. Using the term "location, location, location," he likened the closer connection to how businesses benefit form being in the right place. "This is going to make collaboration easier and enable JICS to bring computational sciences via the CFD Lab to an even broader range of students," he said. "It will elevate the quality of graduate student research accomplishments and contribute to raising the academic performance of computational sciences in the College of Engineering."